The neighborhood of Carmel Rancho is bordered by Val Verde Drive to the west, Carmel Valley Road to the north, the Carmel River to the South and Via Mallorca to the east. 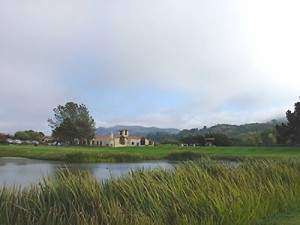 The neighborhood is home to the Rancho Canada Golf Club. Townhome living is abundant in this affordable neighborhood and many units have lake and mountain views and park like grounds. The Arroyo Carmel and the Riverwood complex are located along Rio Road and offer convenient a lifestyle for residents. Units with 2 bedrooms are priced in the mid $500,000’s. Other notable features of the neighborhood include Carmel Middle School, a distinguished California School located on Carmel Valley Road and the Carmel Unifies School District Office. Click here to preview all Carmel Valley homes for sale in the Carmel Rancho neighborhood. For all available Carmel Valley real estate, click here. For a Living at the mouth of the Carmel Valley you have easy access to Hwy 1, public transportation and a myriad of shopping and dining options within walking distance. For a detailed analysis of Carmel Valley real estate sales, check out our monthly Community Market Reports. For golfing enthusiasts Rancho Canada is a fun and challenging set of courses. The property has 36 championship holes on its east and west golf courses, and an award winning pro shop where you can have your clubs custom fit or rent Callaway golf clubs. You will also find excellent instruction and practice facilities and after working up an appetite on the greens you can visit the Golfer’s Grill for a delicious lunch or cocktail at the full bar. Living in Carmel Rancho you are within walking distance of the Crossroads Carmel Shopping complex with over 70 shops from essentials to luxuries. Here you can easily take care of you every day errands and pick up your groceries at Safeway, your pet food at Pet Express and your prescriptions at CVS pharmacy. Once your errands are complete you may want to stroll this bustling outdoor shopping arena and stop in for a gourmet chocolate at Lula’s Chocolates or window shop at the various jewelry and fashion boutiques. There are also quite a few salons to choose from when you desire a little pampering. Don’t forget to stop in at Carmel Valley Roasting Company for a delicious coffee to complete your trip. To live in Carmel Rancho is to have convenient access to the best of Carmel, Pebble Beach and Monterey. Those with children will have access to excellent schools within the Carmel Unified School District. Outdoor enthusiasts will enjoy the close proximity to gorgeous beaches for sport and recreation, and the incredible cycling to be had along Carmel Valley Road. Golfers can take advantage of Rancho Canada or venture into Pebble Beach to play on one of its seven world renowned golf courses. Homeowners appreciate the value and affordability of living in Carmel Rancho and the ability to such great access to world class shopping, dining, entertainment and events along the Monterey Peninsula.